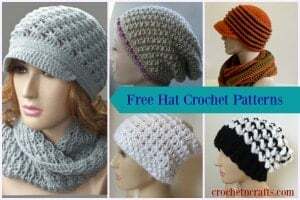 FREE Women’s Top Crochet Pattern in Four Sizes! Okay, so I got issues. I’m small, like a kid-size small. Seriously, if it weren’t for my big(ger) bum, grey hair and wrinkles, I’d still look like a 12 year old. But I’m not the only one. There are many other women who are just as short and even shorter than I am. So I can’t really complain, but it does make life a wee bit more difficult sometimes. And this time around, my problem is that I can’t find an extra small mannequin to model my tops for me! Or maybe I just havn’t looked hard enough, but I just can’t seem to find one. I thought if I bought a blow-up one I could deflate it to my size, but it’s not working either. You gotta love my ideas sometimes, but I try. :) So until I have the time to make one my size, you’ll get to see my XS tops modeled on a Small. I apologize for this, but at the moment there’s not much I can do about it. Now on to the top. It is available in four sizes from XS to Large. I followed a grading course and a standard size chart, so hopefully the sizes will come out close to what you need them to be. And you can always make adjustments too by making it wider and longer as needed. I wasn’t comfortable writing the pattern for XL and up, but you could easily make it any size that you like including XL and larger. You simply make your chains to be half the width you need provided it’s in the multiple given. Then simply crochet until you’ve reached a desired length. Neckline and arm openings can be adjusted as needed when you do the seam. And, it’s shown as a tight garment, but you could also wear this as an oversized top by making it a few sizes larger than needed. So, there’s definitely a lot of fun to be had with this top. Yarn: Loops and Threads Soft & Shiny 3, (3, 3, 4) 6oz/170g balls. Or use any similar (#4) or cotton yarn that meets the gauge. 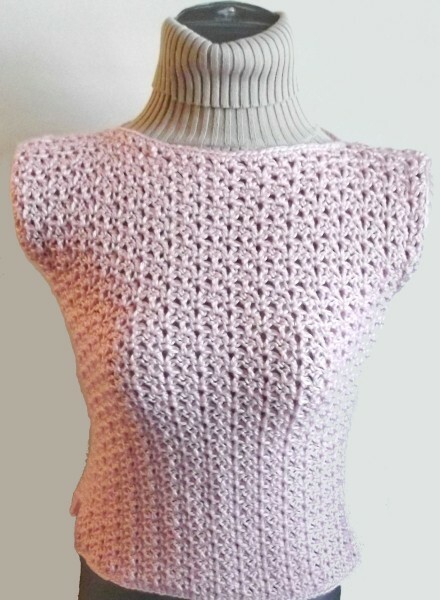 Finished Size: To fit bust 30, (34, 38, 42). When laying flat is measures 16″, (18″, 20″, 22″) wide by 20.5″, (21″, 22″, 22.5″) long. Size is given in X-Small. Small, Medium and Large are given in Parenthesis. V-St: (dc, ch 1, dc) in designated chain or space. Tutorial for the Blossom Stitch. Neckline: Some testers found the neckline to be too close to the neck. You can somewhat adjust this by decreasing the shoulder seam. For example, instead of sewing 3.5″ on each side, you might only sew 3″ on each side etc. Ch 65, (73, 81, 89) or any multiple of 4 + 1. Row 1(RS): V-St in 3rd ch from hk (first skipped ch counts as turning ch and first sc), *sk next ch, sc in next ch**, sk next ch, V-st in next ch; rep from * across ending last rep at **. (16, (18, 20, 22) V-sts) Turn. Row 2: Ch 4 (counts as first dc and ch-1 sp), *(sc, ch 1) in v-st, (dc, ch 1) in next sc; rep from * across working last (dc, ch1) into turning ch of previous row. Last ch-1 made counts as turning ch and first sc for next row. (32, (36, 40, 44) ch-1 sps) Turn. Row 3: *V-st in next sc, sc in next dc; rep from * across. Turn. Rows 4-54, (56, 58, 60): Rep rows 2-3 until you have reached a desired length making sure to end with row 2. With RS facing together sew the shoulder seams 3.5″ (4″, 4.5″, 5″) on each side, leaving a 9″, (10″, 11″, 12″) opening for the neck. Shorten the shoulder seam for a larger neck opening. Sew side seams leaving a 2″-3″ slit at the bottom, and a 7″ (7.5″, 7.5″, 8″) opening for the arms. Shorten the side seam for larger armholes if desired. Neck and Arm Openings: Join yarn (preferably along seam), ch 1, sc evenly around; join with sl st in first sc. FO. Bottom Edging: Join yarn (preferably along seam), ch 1, sc evenly around working 3 sc into corners; join with sl st in first sc. FO. Hope you enjoyed this pattern. Use the print friendly button below to print a PDF, or get an Ad-free PDF for only a buck on Ravelry and Craftsy. And thank you so much to my awesome testers for testing this out for me. And last but not least, you might also be interested in the FREE pattern collection on CPB for Women’s Summer Tanks & Camisoles. Hello! I made this top and now I am interested in adding sleeves to it. I was wondering if you might know a sightly way to decrease this pattern stitch on rows as I go? I am crocheting the sleeves directly on the garment, and it looks good so far, but decreasing after the elbow to make a nice fit doesn’t look so good. I would appreciate any suggestions. I like the pattern a lot, but decided to adapt it to being a winter sweater, as it is too hot here to wear for the summer. Sorry, I don’t have a pattern for the sleeves at this time.